Yet he died!!! A murder or a suicide? If it was a murder, who did it? 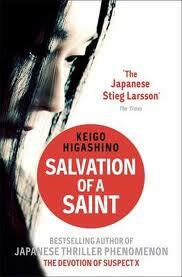 This forms the rest of the story named Salvation of a Saint penned by Keigo Higashino of The Devotion of Suspect X.
Detective Kusanagi with his able team containing Utsumi and Mamiya along with the help of Professor Yukawa takes up the onerous task of solving the mystery surrounding the sudden demise of Yoshithaka. To begin with I had high expectations. After all, it is just a year since I read and reviewed the author’s first book named The Devotion of Suspect X. That story was mysterious and carried a puzzle that was very difficult to solve. Yet as readers, we knew who killed who. And the beauty in this story is that in this story also we know who killed who only, yet the author has maintained the element of suspense throughout. Though Yoshithaka is killed very early, we get to know more about him as the story unravels. He is a man who longs for a family… Blood relations rather. His obsession towards making babies is well justified. Yet, we also wonder why he is so businesslike. As Kusanagi thinks, we also think what Yoshithaka thinks about women - a baby factory?! Ayane comes across as devoted wife. She is calm and collected throughout. The shades of her characterization are contradicting. Yet, we feel convinced. After all, none of us are completely white or black. We are all shades of grey and so she is! Hiromi is someone heavy weight at heart. She undergoes a thorough dilemma of whether to regret or not. The series involving investigation makes at laugh at times. After all, she is asked the same question again and again. We can only empathies her situation. Regarding… what question was repeatedly asked… Well, I have no answer for that. You better grab the book and it yourself. Yes. You heard it right. You can indeed go for the book. The book is an assured page turner with twists and turns. It shows us the various shades of each character. The narrative is swift and involves lots of conversation. Hence, we never feel bored. We just feel as a silent spectator letting the detectives do their job. There are limited characters and hence we could empathize with each one of them. As readers, we can understand what they are going through and what led them do what they did! There are around 370 pages. It is a kind of book that will force you complete it in one sitting. A masterpiece indeed! The author is promising and looking forwards for more from him. And yes… I hope that the author gives more mysteries to detective Kusanagi to solve. In short, it is a gripping tale. The plot is impeccable and puts across a perfect crime.